USA -(Ammoland.com)- According to the news media, an AR 15 Rifle is any gun that someone uses in the act of doing something bad. What is an AR-15 really? Technically speaking, AR-15 is a brand name, like Kleenex or Xerox. And, just as with Kleenex and Xerox, the brand name has been hijacked by the general public to describe a whole class of things. Who in corporate America asks their intern to “make a photocopy of that document using the Canon copier?” Or at home, few parents tell their kids to “grab a Cottonelle nose cloth before you sneeze!” Exactly. When a brand name is successful, we regular folks tend to commoditize it. Before we dive into the history of the modern AR 15 Rifle, we need to look the “AR” part. AR does not stand for Assault Rifle. Or Automatic Rearming. Or even Apoplectic Ruin. It is a product naming convention from the company that invented it, ArmaLite. In fact, there were a number of rifles with “AR” names, like the AR-1, AR-5, AR-7, AR-10, AR-16 and AR-17. Let’s do a quick review of AR15 Rifle history what got us from conception to where we are today. 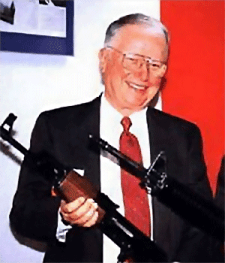 Eugene Stoner responsible for early development of the AR 15 rifle. ArmaLite was founded as a division of Fairchild Engine and Aircraft Corporation. While most people equate the AR 15 Rifle with military variants, the company was actually founded with the goal of developing civilian market guns using modern materials and manufacturing technologies. The initial business plan called for establishing some success with commercial products, then using that momentum to get into the government and military business. Plans don’t last long once the action starts… Upon request from the United States Air Force, ArmaLite develops the AR-5 survival rifle. The AR-5 was a modular rifle chambered in .22 Hornet with a four round magazine and bolt action. The receiver and barrel disassemble and can be stored inside of the over-sized stock. This design not only makes the AR-5 waterproof, but also allows it to float. That’s handy for over water ejection scenarios, as downed Air Force pilots were not keen about scuba diving to retrieve their gear. The modern day version of this rifle is the Henry U.S. Survival Rifle made by Henry Rifles. Armalite AR-5 .22 Hornet Survival Rifle : This “AR” doesn't look much like a mythical “Assault Weapon” does it? The U.S. Army began a search for a rifle to replace the M1 Garand. While the Garand served admirable in World War II, all that combat use uncovered some areas for improvement. For example, soldiers wanted more magazine capacity than the eight rounds offered by the M1 Garand. Also, weight was an issue, with the M1 tipping the scale at ten and a half pounds. With World War II soldiers carrying their gear for (literally) years at a time, every pound counted. Front runners in the contest were an updated design based on the M1, the Springfield Armory T-44 and the T-48, which was based on the FAL design. ArmaLite submits plans for the AR-10 rifle with similar caliber and performance characteristics as the T-44 and T-48. Unlike the others, the AR-10 incorporated radical design changes that allowed use of lightweight aluminum receivers and plastic stocks and hand guards. The key to the design was using a steel barrel extension to lock up the bolt rather than the receiver itself. This allowed use of lighter and less strong materials for receiver construction. The AR-10 weighed less than seven pounds – in theory allowing a solider to carry three extra pounds of ammunition and/or gear. ArmaLite entered the contest too late in the game to work out new design kinks and ultimately the T-44 was adopted as the M-14 Rifle in 1959. Seeing possibility in the AR-10 design, the Army asks ArmaLite to work on a smaller caliber version to be named the AR 15 Rifle. The project is exploratory, as the military doctrine of the time called for large caliber rifles to be used in engagements at longer distances. ArmaLite sells the AR-10 internationally through a licensing agreement with Artillerie Inrichtingen, the Dutch Arsenal. Not even the Dutch adopt the AR-10 and international sales are light. At this time, ArmaLite is only really selling the AR-5 aquatic survival rifle, so revenue pressures mount. ArmaLite licenses both the AR-10 and AR 15 designs to Colt Firearms. Robert Fremont, a key player in the design team of the AR-10 and AR 15 Rifle models, leaves ArmaLite for Colt Firearms to help with continued AR rifle development. ArmaLite launches the AR-7 Survival Rifle. The AR-7 was a .22 long rifle caliber rifle targeted at the civilian market, although a number of military organizations around the world bought it. Colt Firearms sells the first AR 15 rifles to the Federation of Malaya, later to become known as Malaysia. Eugene Stoner leaves ArmaLite to serve as a consultant to Colt Firearms. At this point, ArmaLite was out of the AR-15 business – for the time being. The United States Air Force tests the AR 15 Rifle and purchases 8,500 rifles. The Air Force standardizes the AR 15 and designates the rifle M-16. 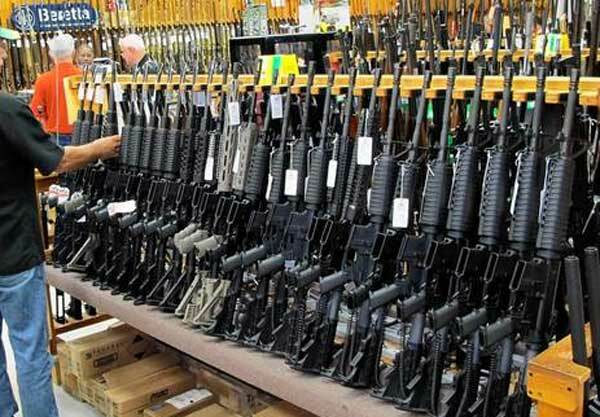 85,000 rifles are purchased by the Air Force. Also this year, the US Army purchases 85,000 more M-16 rifles. By this time, the M-16 had become the military’s primary service rifle, with over 300,000 purchased from Colt, now known as Colt's Inc., Firearms Division. ArmaLite is sold to a Philippine company, Elisco Tool Manufacturing Company. ArmaLite operations in the US are ended by Elisco Too Manufacturing Company. Colt loses the government contract to supply M-16 rifles to the military. Jim Glazier and Karl Lewis of Lewis Machine and Tool Company (LMT), operating a new entity called Eagle Arms, begin producing complete AR-15 rifles for the consumer market. By this time, many of the earlier AR 15 Rifle related patents had expired, thereby opening up the market for complete AR-15 type rifles. Colt, now known as Colt's Manufacturing Company, Inc., enters Chapter 11 Bankruptcy proceedings and a period of litigation. Mark Westrom purchases Eagle Arms. Colt wins a contract to supply 19,000 M-4 Carbine variants of the M-16 to the US Army and Special Forces Command. Westrom and Eagle Arms purchase rights to the ArmaLite brand. Within a year, ArmaLite is producing the AR-10B rifle, chambered in .308. During this period, Knight’s Manufacturing produced an AR-10 derivative rifle, the SR-25. Colt wins another contract for 16,000 M-4 Carbines. Colt’s wins back the procurement contract for military M-16 rifles with an initial order for 32,000 M-16 rifles. An additional order follows to upgrade 88,000 M-16 A1 rifles to the A2 configuration. With support from the National Shooting Sports Foundation (NSSF), the term Modern Sporting Rifle gains popularity as a more descriptive name for AR-style rifles. Racks of new Modern Sporting Rifles. The AR 15 Rifle is well on its way to be America's most popular rifle ever. At last count, 16,973,489,012 companies are making AR-style rifles. Actually, I lost count at just over 12 million, so this number is really more of an estimate. Whatever the actual figure is, it's a lot. Kidding aside, the AR 15 Rifle has become the most popular general purpose rifle platform since, well, since ever. Tom McHale is the author of the Insanely Practical Guides book series that guides new and experienced shooters alike in a fun, approachable, and practical way. You can also find him on Google+, Facebook, Twitter and Pinterest. Jim Glazier and Karl Lewis of Lewis Machine and Tool Company (LMT), operating a new entity called Eagle Arms, begin producing complete AR-15 rifles for the consumer market. Colt sent a pilot model rifle (serial no. GX4968) to the BATF for civilian sale approval on Oct. 23, 1963. It was approved on Dec. 10, 1963, and sales of the “Model R6000 Colt AR-15 SP1 Sporter Rifle” began on Jan 2, 1964. The M16 wasn’t issued to infantry units until 1965 (as the XM16E1), wasn’t standardized as the M16A1 until 1967, and didn’t officially replace the M14 until 1969. Colt had been selling semi-automatic AR-15’s to civilians for 5 years by the time the M16A1 replaced the M14. Going off of the serial number records for the SP1, Colt had sold at least 2,501 rifles to the civilian market by 1965, 8,250 rifles by 1967, and 14,653 rifles by 1969. My cousin still has a Colt model R6000 AR 15 SP1 he bought in 1964. I just finished reading the many comments here and I would like to know where people get the idea that problems can be solved with a firearm. Yeah, I am an old fart, and I watched all the cowboy shows, war shows and police shows and movies growing up and I never got the idea that guns solve problems. Richard Boone went out of his way not to have gun fights in Have Gun Will Travel. and Wild Wild West was judged as to violent, 1968? and taken off the air. Look at what the generations are being brought up with in computer games, movies and TV shows. No wonder the present generation goes to the gun. A lot of this newer media spreads the word that Violence is ok. I was brought up around WW2 vets and the last thing they wanted to see was war movies or killing. They saw the real thing and wanted nothing to do with it ever again. People are getting desensitized to all of this and forgetting thou shalt not kill. I never want to see what my father and my uncle’s saw during WW2. Banning of guns and high cap magazines are not going to stop these problems. We already have a background check system in place that works. However it is only a computer system and it is only as good as the information put into it. An example of that is the Virginia Tech shooting. The shooter was judged not compident by a doctor but the doctor did not enter this information into a data base that would have stopped the purchase of a firearm. The FBI had the information about the shooter in the resent Florida shooting but they did not act on it. I do not blame the doctor or the FBI for either of these shootings. The doctor had a choice to make. His diagnosis could possibly cost his patient his job or get him kicked out of school. Ask yourself should one person hold the life and future of an individual in there hands? The FBI along with many law enforcement agencies across the country are having budgets cut and have to reduce the size, and with that the quality of their services. We already have many gun laws in place and we should enforce those law already in place. This means supporting law enforcement in this effort. Just think what might have happened if somebody desided to followup with the FBI about the paperwork that was sent in. A firearm is a machine. It needs an operator to make it work. The machine is not the problem, the person that uses the machine in an unacceptable manner is the problem. In 1967 my father brought home a bumper sticker that read: WHEN GUNS ARE OUTLAWED ONLY OUTLAWS WILL HAVE GUNS! Remember, criminals don’t care about laws. The MSM, all the anti-gun groups call every gun an “assault rifle” or weapon. A few years ago all evil guns were AK47 even if it was an SKS. Basically anything but John Wayne’s Winchester 92 as evil. If I go into a store to look at and wish, I ask to see a Daniel Defense or maybe a Ruger AR556 or a Springfield Spirit. I do like MSR for Militia Standard Rifle, suitable for duty when a militia needs to form from the people motivated to defend the Constitution. If you read history and military descriptive names, the M1903 Springfield was a Musket, rifled, magazine fed bolt action. The M1 Garand was a Musket, rifled, clip fed, air cooled, self-loading. A fowling piece was a 16 or 12 gauge smoothbore with light weight barrel intended for wing shooting. A musket was a heavy duty shoulder fired weapon with either a smoothbore or rifled. Caliber of a military musket was usually 75-80 caliber or 8 to 10 gauge, smooth bore for easy fast loading. Used with either shot for birds and small game, buck shot for deer and people or ball for elk or people. Rifles were fairly common by 1750, were slow to load, more accurate and usually small bore 37-45 caliber. Eventually the use of musket was dropped as being redundant and rifle was used alone. Huh? Muskets are smooth bore, and it has nothing to do with length or weight. Rifles are just that, rifled. I have a model 1842 Springfield musket, caliber .69 that is lighter than my M1 Garand, US Rifle, Caliber .30, M1. My Springfield 1903A1 says on it US Rifle, Caliber .30, M1903. There are some countries that called their long barreled rifles muskets if they had a full length stock but the designation was not official, to my knowledge, just jargon to differentiate the length. why do people keep talking about what you need or what you would use it for or what purpose a particular firearm serves. “the right of the people to keep and bear Arms, shall not be infringed” PERIOD! It has only one comma when ratified in 1791. It still had only one comma when when Alaska and Hawaii copied it in 1959. Lots of people has a hard time understanding what it means, what was intended. The extra commas allow some to read `The militia, , , shall not be infringed.’ This of course is wrong. To make it easier I’ve made a change to clarify while not changing the intent or meaning. Well regulated was defined in the 1792 Militia Act when Congress specified what equipment, caliber and quantity of arms a person was required to have. The word KEEP is included because the Founders remembered when te war started because the British tried to confiscate arms. So “arms” could be kept at numerous locations so confiscation would not be possible. Gary, How many Machine guns or Sawed-off shotguns are legal in the US? Do you believe you have a second amendment to own them? About 250,000 machineguns, maybe a million or more short barreled shotguns and maybe a million short barreled rifles. There are also “any other weapon” categories that don’t fit te classical 80 year old definitions in law. Yes, U.S. citizens have an absolute right that isn’t supposed to be infringed to own arms suitable for military service. For reference see SCOTUS 1939 MILLER. So a FLAME GUN is also ok for the general population to own, right? Have you ever shopped at TSC, or Menards? Flame throwers are popular and sold for weed control. Even if you aren’t a farmer, Hollywood and TV have all sorts of equipment which they often appear to use for theatrical “illegal” uses such as bank robbery, murder and fire breathing monsters. Yes, people can have all sorts of dangerous things. It is only HOW YOU USE the chainsaw, lawn mower, bulldozer, car, van, truck or rope that is illegal. Wow! Just purchased twenty ProMag 42 round magazines for my American Sporting rifles, in anticipation that they may become scarse in the future. Cheaper Than Dirt has them available for $11.97 in desert tan. Better to have them and not need them than – – – yada yada. To the IDIOT saying no such thing as a 10 round magazine (I think he called it clip) again remember what you are. An IDIOT. 5 round, 10 round, 15, 20, 30 and yes, 42 round mags for our American Sporting rifles aka AR15 ARE AVAILABLE. Starting at 6.89 each on CTD. Spend $50 and get free shipping. Yes I hunt with these. Hogs and Coyotes primarily. I’ve taken several deer with my Mossburg MMR and Ruger Ranch Rifle Mini 14. So there IS a reason for an AR styled weapon’s use, especially on the farm and ranch. Oh, I also put down for two stamps yesterday, for my Gemtech 22 and Omega 45K. So you libtards out there? That puff you thought you heard was another hog falling dead from my suppressed 42 round mag AR15. You are claiming that almost 17 BILLION . . . Companies . . . are making AR15-style rifles? Surely you jest? According to a search I just did the global population is 7,632,819,325 (give or take, I guess). Or roughly 7.5 Billion people. So you are saying there are around 2.5 times as many AR15 companies that there are people on the Globe. Seriously…? Did you leave your humor at home today? Can anyone tell me how many hunters use the AR-15 and for what kind of hunting? I am not for a lot of gun control, our son controls his guns. Our eight-year-old granddaughter bagged her first deer last year with a shotgun – & the jerkey was great. But the AR-15 used in Parkland was so high velocity it just blew big holes thru the kids with no chance of survival – according to the radiologists reviewing the internal images of the bodies. The internal damage to their bodies was unbelievably severe with an exit wound the size of an orange. I don’t know what the answer is but we have to somehow stop our children from being blasted apart with these high capacity, high velocity guns. Somebody quick, tell the girl who was shot three times, twice in the torso including gut and chest, who had a press-conference that she is dead. I saw her on TV news, her picture and the story is in the Tampa Bay newspaper. DEERFIELD BEACH — Maddy Wilford, 17, is grateful to be alive after surviving three gunshot wounds from an AR-15 assault style rifle during the worst school shooting in Florida history at Marjory Stoneman Douglas High in Parkland. The high school junior was shot in the abdomen, right elbow and chest, and still carries pieces of metal in her body from the Feb. 14 mass shooting. Trauma surgeons at Broward Health North in Deerfield Beach performed three operations on her. She went home on Thursday, although she has weeks more of recovery ahead. Doctors performed three surgeries in a 40-hour period, he said. Maddy was hospitalized for about a week. Nichiporenko said the trauma team at Broward Health North sees gunshot victims “almost every other day,” but that the injuries Maddy sustained from an assault style weapon were much more severe than doctors are accustomed to seeing. An assault style weapon, Nichiporenko said, causes much more severe damage because the high-speed bullets cause waves that ripple and tear apart nearby soft tissue as they travel through the body. The AR fires a low-medium power and velocity cartridge, a deer rifle is more lethal. Saul Alinsky rules say to demonize and then you can say anything because you’ve defined the issue. The AR fires a 5.56×45 NATO cartridge, a .22 caliber compared to the older cartridges such as the 7.62×51 NATO or the 7.62×63 [.30.06 ]. In fact the entire 5.56×45 cartridge can fit into a .375 caliber rifle as far as diameter. The survival rate at Parkland was 45% despite the fact that medical help was not allowed inside te school for a long period. How many bled to death waiting for the sheriff to allow the EMTs in is just a guess. The AR 15 is a Modern Sporting Rifle, and you can get it in many calibers so you could hunt about anything. Many prefer it as a hunting rifle because it is weather resistant, accurate, light to carry, and the most common Modern Sporting Rifle in America. The person claiming they do more damage than other rifles doesn’t know anything about firearms. Any rifle shooting the same caliber will do the same damage. Also, guns are dangerous, if it can kill a coyote, deer, elk, etc. it can kill a human of any age. Any firearm made can kill, they are currently working on hardening the schools to make the children safer. Arming teachers who are qualified so they can stop a shooting much faster than waiting for the police to arrive, and the teachers love these kids, they will not stand outside while someone is shooting children inside like the officers at the recent shooting. Metal detectors at doors, stronger doors with locks on each classroom in case a nut enters the school and tries a violent act again. The more common .556 caliber AR15 is far weaker than most other firearms. A standard hunting round like a 3006 or a 12 gauge shotgun is far more powerful and would have done far more damage to a person who was shot. Hmmm, something about that reminds me of the Sandy Hook Massacre. Oh yeah, no first responders were allowed into the school at Sandy Hook, either. Now why would that be ??? Maybe we can ask Capt. Israel. @Lane, Deer, coyotes, and anything on down. The Ammunition for the Modern Sporting Rifle is not high velocity, and the bullets are light weight. 24 grains of powder 77 to 45 grain bullet. It is a poodle shooter. The no chance of survival is dependent upon the wound. If the kid would have used an old shotgun in those crowded halls, the casualty rate would have been much higher. The answer lies in truth telling not propaganda. The evil of this deed began and ended with the person that decided to shoot other people, not inanimate objects like the Modern Sporting Rifle. @WB… WE could use some of that rain. We are under wind warning and fire danger alerts , other wise things have been peachy . Sammy is standing right here wanting attention, says HI. @WB…Still haven’t found your full post as I still cannot get e-mail response. I can’t tell you how many hunters us ARs in the various calibers but it is many. Every year I buy one, or more, new rifle(s). It, or they, have to earn their keep by bringing home dinner. The last 3 years have been AR-10s and variants in .308WIN (Ruger SR762, SIG716, Ruger RPR in.308[not really an AR]). Elk, it’s what’s for dinner. It is nice to have the ability for a quick followup shot but so far all my elk have gone down with one round of 180gr Nosler AccuBonds on top of IMR 4895 powder. I own lighter rifles that for sure but every rifle has to earn its keep so it gets used hunting. I do use my numerous AR-15s on coyotes. They are dandy coyote hunting rifles. From reading the article you reference, I do not believe that radiologist has ever seen a rifle wound. What he said about the increased damage is true, but only if you compare to common handgun calibers, such a 9mm, .38 special, .45 ACP. Compared to *rifle* calibers, the AR-15 .223 cartridge is on the low end of both diameter and energy. The most common deer hunting rounds, the .308 and the 30.06, do far more damage. The .223 is well suited to coyote and hogs. With the right ammo and good shot placement, they are adequate for hunting deer. However, some states ban the .223 cartridge because they consider it *underpowered* for humanely killing deer — too much risk of a wound that is not quickly fatal. If you read carefully, you will note that the radiologist never compares the damage from the AR-15 ammo to that from other rifles. He never talks about rifles, per se, being more damaging than common handgun rounds. His wording is so careful I have to believe that he wrote it to be accurate (AR-15’s do more damage than handguns) but misleading (a casual reading leads one to believe that the AR-15 is more damaging than other common rifle calibers, when the opposite is true). To read the chart, look for .223 REM. The AR-15 standard caliber is .223 REM or the nearly identical 5.56mm. The shotgun slug your daughter used to take her deer leaves a much bigger hole. I Carried one of the Air Force’s AR15/16 as a Security policeman stationed at Harmon Air Force Base in Stephenville, Newfoundland in 1965/66. No you didn’t, you carried the first gen M16. No AR15 has been issued by the DOD, USAF or been deployed by anyone in any field of battle. I think you are referring to the AR5 survival rifle. It good be collapsed into the stock for easy storage. As I recall the AR 5 as pictured above in te article, is a bolt action .22 Hornet, air crew survival rifle capable of taking small game for food and defense despite being very limited in power and range. The rifle could be disassembled and entirely stored within the stock. The barrel can be removed from the action and it all can be stored in the buttstock. It will float whether contained in the stock or fully assembled. If you’re into wilderness canoe trips it is the perfect packing rifle. We should get away from calling them Assault Rifles. The police refer to them as Patrol Rifles. So we should call them Patrol Rifles or Sporting Rifles. Eric, I assume you know that the AR was designed specifically to kill humans, hence the name assault. I agree that they are fun guns to target shoot, but I think the danger of them exceeds their value in society. I think they should be banned. At a minimum, large capacity magazines should be banned. @Allan We assume no such thing . these rifles were never named assault rifle except by the left wing pantywaste (sp intentional) snowflake communist . @OV, You have discovered another low level propagandist! His script writers do not mention that during Clinton’s Unconstitutional MSR ban, Columbine happened. Nor do they mention that the shooter in Florida only had ten round magazines. His handlers do not mention that all of these instances prove that bans do not work. Blaming inanimate objects does not work. So what are his handlers really after? Where can ANYONEFIND A TEN ROUND CLIPS FOR AN AR15??? No where, ITS EITHER 20 ROUND OR 30 ROUND CLIPS. NEVER EVEN HEARD OF A 10 ROUND CLIPS FOR AN AR15. well her are 10 or so off out one store. The AR15 does’t use any type of clips !!!! Therefor you can’t find ANY SIZE CLIPS for a AR15. oldvet: You deny that the common parlance for an AR15 is an Assault rifle? Nice try. Your name calling and over-generalizations are comical…. Are you projecting a touch? An assault rifle is select fire. That is, it is capable of fully automatic fire or one-trigger-pull-one-shot, as you select. The M-16 is an assault rifle. “Assault weapon” is a legal or political term, and it has differing definitions depending on the bill or law. AR-15 is always included explicitly. Legislation also specifies other weapons by feature. Under the current bill before the House, both the Glock 17 pistol and the Remington 1100 shotgun are assault weapons. It is true that some politicians and media erroneously describe the AR-15 as an “assault rifle”. Bill Nelson is one of the most notorious for this. I suppose it is true that if enough people misuse terms, dictionary publishers will modify the definition; by such a process, language becomes less precise and clear communication more difficult. Perhaps that is the goal of such misuse? @Alan …I did not studder , did your ears flap ? Once again the left wing racist communist socialist fashist try to force their twisted meanings on everyone else. BTW @Wild Bill and all else Gasoline went up here a gain between noon and 2 pm. I saw one brand that went from $ 2.25 up to $ 2.47 . Another brand you would all recognize if I named them, (you can find them on the corner of about every square mile around here) Went up to $ 2.55 . @Alan …Forgot to add Snow Flake basement dwelling pantiewaste. @OV, Well said and accurate, but a paid troll as well. Let us starve him. Best regards to Sammy! The term “assault” is a relatively new term coined by anti-gun proponents. They coined the phrase and it caught on with a liberal media. Why are they more dangerous than any other caliber? They’re not, in fact, they’re less dangerous. The rifle doesn’t cause the damage, the bullet does. I think more damage could have been done with a shotgun filled with buckshot in the school hallways. Probably more damage could have been done with 5 shots than the rifle did with 30. @AW, “Assault rifle” is a liberal made up term designed to make them evil sounding. The police refer to them as Patrol rifles and we should too. I assume you know a large capacity magazine is actually a “standard capacity” magazine. Again, large capacity is another liberal term designed to make them more evil. By the way, the standard magazine ban in effect in California didn’t stop the San Bernardino shooting. Did you know that? I can tell you about my own personal experience. I grew up with guns all my life. Born and raised on a 40 acre farm in northern Michigan, and we also had a cabin further north that my dad used for hunting as well. My dad, uncles, and all his friends were all avid hunters. He hunted for at least 50 years ( he’s 84 now), he also served in the Korean War. In addition, my first husband, was President of the Mi Trappers Association, ( he too was a serious hunter). If a REAL HUNTER, is being truthful about it- he will say the same thing too about these types of Weapons and Bump Stock. Always Follow the Money: Whose making money? Why is it so hard to change the law on these types of weapons? Again follow the money, Every time there’s a mass shooting, gun sales sky rocket ( doubling to tripling in sales) follow the money. Don’t take my word though. Research unbiased literature it’s out there. If it has wording like Trumpanzies or Libtards it’s junk, written by someone who can’t see the truth. Does he prefer the Model T instead of a Jeep Wrangler? Fifty year ago I worked in a sporting goods store and sold a lot of rifles, handguns and shotguns. We did not call the Colt AR 15 an assault rifle, we called it a Mattel toy. The boss didn’t like the plastic. When the Ruger Mini 14 came out the Boss said Everybody should have one. Same caliber, same size magazine but a wood stock. The Mini 14 was not very accurate and the AR may be the most accurate off the shelf production rifle. WiKi is often drivel and even lies. Anybody can write or edit WiKi and lots of people think it is the truth. The Lisa troll does not know that Congress, any state legislature, any county or any city council has no authority to out law any kind of rifle, Armalite, modern sporting, patrol, or any other. @Lisa Walker , What does this have to do with hunting only. Give me a break. The AR for one IS a good hunting rifle as well as a great target rifle. But so what! The second amendment is a warning to the Government to keep their stinking paws off of my guns! The moment they even talk about taking away constitutional rights they are stepping towards tyranny. People are getting sick and tired of the double speak when it comes to guns. Obama was a good a good one for that. Always muddying the water about saying no ones coming for your hunting rifles and shotguns. No Allan. Stop reading from your prepared anti-gunner script and read above. AR does NOT stand for assault but ARMALITE. Idiot. No Allen, the way I read the history ,Stoner and company’s initial intent was for the commercial market. This would more likely be for hunting or self defense. Both hunting (small game only in AR-15 form as it is a low powered round compared to most hunting rifle calibers) or for self-defense, are satisfied by the current commercial versions available to the public. The military just adopted the platform and reengineered the platform to be more suitable for combat, i.e.fully automatic. The current commercial versions are not really combat capable as semi-automatic rifles would be at a significant disadvantage compared to the enemy’s weapons. What is available to civilians still only meets the initial intent of the designers. As for killing humans…yes, they will do that if that is the intent. That can also be said of any other inanimate objects such as baseball bats, knifes, trucks-cars-buses fertilizer, poison, fire, fists, feet, rocks, broken glass, airplanes, etc., etc., etc. There will always be people that want to kill other people, it’s human nature and after the thousands of years we have been on earth, there is still a percentage of the population that , for one reason or another, has that need. Our best bet is not to focus on the tool that they use, as there will always be some tool used to kill each other. We need to focus our energy where it will actually make a difference and find a way to love one another a little more. We need less people that want to kill other people, not less tools. I don’t think Allan read the article… AR doesn’t stand for Assault Rifle nor was it designed to kill humans. Good grief. Ignorance is abundant on the gun ban front. Where did the term “Assault Weapons” come from? The Right blames the Left, the Left blames the Right, and in the meantime the group making ALL The MONEY is just laughing all the way to Bank: So tell all your friends, family, co-workers, unborn children etc. The popularity held the ideA that the term “assault weapon” originated with anti- gun activists is wrong. The term was first adopted by manufacturers, wholesalers, importers, and dealers in the American firearms industry to stimulate sales of certain forearms that did not have the appearance that was familiar to many firearms owners. The manufacturers and gun writers of the day needed a catchy name to identify this new type of gun. Actually Lisa you are ignorant of the history of the term. The ban happened in the 90’s under the Clinton’s along with the free gun zones. The military always refers to these tools as weapons or rifles. “Guns” we’re for fun and if you were in the military you would know the rest of the memory tool phrase. Every tool became useful for assault when they were in our hands because as liberals point out, the military is where the government trains people to be specialized in our defense of the Constitution of our Nation. Funny how only impressionable movie trained and video game trained killers commit the atrocities in gun free zones. Actual the AR stands for Armaite…the creators of the rifle…nothing more. No, it is not. If you state the AR 15 and the M 16 are the same weapon, you are either ignorant of the facts or lying. They literally are the same basic rifle, both by design and purpose. The design of one was modified to become the other, and then modified again to be a new version. The AR-15 design was used to make the M16. Then a new version of the M16 for law enforcement and the civilian market was made; it was the new AR-15. Hmmm …… Let me see if I got this. The AR-15 is “literally” the “same” rifle, but was “modified to become the other.” I think it got it. What your saying is that they are the same, but different. Actually “assault rifle” is a military term originally from U.S. arms makers translating Sturmgewehr and was used to describe a select fire, light weight , high capacity (compared to traditional rifles), intermediate caliber (between full power rifle and pistol rounds), rifle where as “battle rifle” was a term created for similar features in a full power (308 usually) rifle such as a Cetme or M14. The Sturmgewehr was a German invention tailored to close battle and engagements out to about 300 yards. The Russians duplicated this in the AK47. Stoner knew the American military would never approve of stamped steel and bakelite furniture so he used aluminium forgings and fiberglass to save weight. This was thought of as “space age” and modern. The U.S. Arsenals had already tried intermediate cartridges first scaling up a pistol round in the .30 Carbine, then scaling down a rifle cartridge in the 308 (from the 30.06 M2 round) and found neither to be practical in full auto mode so the 5.56 was eventually derived and coupled with the AR15s “in line” recoil to create a very controllable weapon. The first export AR15 were offered and sold to foreign governments and could be purchased as semi or select fire rifles. Armalite / Colt AR15 as well as Colt M16, M16A1 and M16A2 could also be purchased from Colt, thru their law enforcement dealers, in semi or select fire from the 1960’s thru 1986. Also the patents expired around 1977 and manufactures like SGW – Olympic Arms started selling semi and select fire rifles to the general US public. A lot of the NFA transferable AR15 and M16’s are ex law enforcement trade ins. The author of this article is dreaming. The AK-47 is the greatest battle rifle ever made AND the most popular at well over 100,000,000 sold and distributed. Personally, I would never own a Russian designed AK-47. I’ll stick to an American Rifle. A piston driven AR-15 for me, but that’s just me. It never won any battles in Vietnam. Is that the AK never won or the AR never won? When the M16 went to war they ramped up ammunition production by changing te type of powder used. The new powder was easier and faster to manufacture by the ton. But it burned dirty and fouled the action of the M16. The ARMY had decide to not even issue gun cleaning instructions or materials based on the original tests with the early ammunition. The new ammunition caused jamming. The AR /M16/M4 pattern rifle is easy to manufacture in a modern factory in the USA. They are very accurate and can be adjusted to fit people of all sizes. The low power means little recoil and that makes it easy to train people to shoot it accurately. Millions of AR pattern rifles are being sold and the number of criminal uses of ARs is so rare that the the FBI only keeps records on rifles of all types. The AR is used for varmint hunting such as coyotes, and ground hogs. The police use them because they are light weight, accurate and not too powerful. @gr, Rifles do not win battles. Quality people win battles. We support those quality people with training, logistics, communications, and doctrine. @WB… Yep that’s why all of the American squirrel hunting boys made such good marksmen in WWII . @OV, How you doing, brother. Lots of rain this past seven days. It is so wet that I saw a couple of roadrunners in the hay meadow doing the back stroke! Hi to Sammy! @WB…Would you call those roadrunners wet backs ? You are an idiot, and most here (blaming liberals) are idiots too. In the sixties a 20 round clip was normal. Now the clips are 30 round capacity. Except for 100 round drums…the AR 15 with 30 round CLIPS “ARE” HIGH CAPACITY weapons of war! Although Arma lite WAS looking to make a civilian rifle, the high velocity “tumbling” round proved to be acceptable for using it as a weapon of war. @Howard Moore, I agree. However, i still question the veracity of those that call a magazine a “clip” or refer to 20 rounds as a standard “clip” when the CURRENT standard is a 30 round magazine. In closing, one can anyways tell a liberal because they always resort to child name calling tendencies. “At last count, 16,973,489,012 companies are making AR-style rifles.” Rifles made? I am sure there are not 16 billion + companies! I believe a similar joke is that there are 300 million guns in the US. I used to be an NRA member. Thier dogma over the last two decades changes my mind. It seems that for the last 20 years or so, every word out of La Pierre’s mouth has been carefully pronounced to create fear in tOur Country and sell even more guns and bullets. The man should be ashamed. Join GOA or CCRKBA then. We are in a battle for our future, and NRA needs to be aggressive. And yeas, promote the shooting sports. Nothing wrong with that. Do you suppose the anti gun folks play nice and to unite us? If so, put down the crack pipe. In Viet Nam, we were told it was an m-16 (yeah, I know) and it was a piece of junk. Every time I cleaned it it would jam so I carried a small can of WD-40 and just spray it down every so often. Doing this instead of cleaning worked great and I never had another jam. I guess that’s why I still don’t care for “black guns”. It was not the rifle it was the powder in the ammo(ball over stick powder). If you carried WD-40 and sprayed it down than you caused another malfunction. WD-40 must NEVER be used on any firearm. WD-40 neutralizes primers. And he fought his whole war not knowing this and survived, so much for know it alls. You apparently DID NOT have an M16 with a chrome bolt. I sloshed arround Viet Nam FOR A YEAR AND DUD NOT CLEAN MY WEAPON ONCE. NEVER JAMNED EITHER! You are an idiot, and most here (blaming liberals) are idiots too. In the sixties a 20 round clip was normal. Now the clips are 30 round capacity. Except for 100 round drums…the AR 15 with 30 round CLIPS “ARE” HIGH CAPACITY weapons of war! Although Arma lite WAS looking to make a civilian rifle, the high velocity “tumbling” round proved to be acceptable for using it as a weapon of war. I don’t recall that WD40 was available in small spray cans during the Vietnam War. That’s pocket sized cans. I never saw one until much later. the issued 15 in nam was semi and full auto/ and to my knowledge was never offered for sale to the public . You could buy them right up to 1986. The original M16s the Air Force purchased had AR15 markings on them as well. ok u gents seem fairly smart / what is the difference between an assalt weapon and an assalt style weapon? The proper terminology for an M-16 is: AR-16, light infantry, hand held weapons platform. It is a 5.56MM auto or semi auto weapons platform. Now the definition is: A 5.56mm, gas operated, hand held, magazine feed, air cooled, select fire automatic/semi automatic shoulder fired weapon. It is an armalite rifle actually. It’s now an accepted term. If you look up assault rifle..you will find it defined and even pictured. Language changes, all the time. The term is now accepted and even used among gun owners. We need to stop arguing about the term, especially among ourselves, it’s just silly. Silly? As usual, the Left defines terms and their meaning. Control the language, control the thinking. IMO, none. If a person is assaulted with a slingshot, then the slingshot is an assault weapon. I know that many in the government considers any semi-automatic as an assault weapon. Our government is mostly corrupt. What it considers is corrupt also. An ASSAULT RIFLE is a rifle you whack someone in the head with, there really is no such thing as an ASSAULT RIFLE! As for the ASSAULT STYLE RIFLE again it is a rifle you hold in a position to whack someone in the head! Now if you are really serious about this, the AR-15 Semi-Automatic Sporting Rifle, which fires 1 round per 1 pull of the trigger was developed way before the M-16, where as the M-16 which is Semi- Automatic (1 round fired per 1 pull of the trigger), 3 round burst per 1 pull of the trigger or Full Automatic at 650 rounds per minute or as fast as you can change a magazine and pull the trigger again. There is one hell of a difference between to so called Assault Rifle M-16 and the Assault Look A Like AR-15. The real thing they have in common is they are BLACK in color and weigh about the same. The Military was looking for a new rifle, light weight, fast, easy to maintain, saw the AR and asked if they could be made to Mil Specs (a.k.a. FULL AUTO). Now try to explain this to a Dummiecrat I mean Democrat Liberal and they get all P.O.’d at you! Sorry, but Assault Rifle is a REAL term, M-16, AK-47, G36, FN-FAL, Galil ACE are all examples of “ASSAULT RIFLES” The term assault WEAPON was made up by the liberal media to describe ANY weapon that they don’t like so that they could ban them. Very real. The name originates from the WW Ii German Stermgewher (StG) 44, which literally translates to “assault rifle 44.” As the names denotes, it’s controllable, rapid rate of fire was intended to keep the enemy from returning fire when assaulting a defensive position. It produced a significantly higher rate of fire than the 5-shot, bolt action K98 carbine usually carried by a German soldier. Throughout recorded history of weapons, there has only been “One Rifle” that was classified as an actual assault weapon. I won’t go into details, but, if you do your research, you’ll find out about it and its history. Sorry, but, the AR-15, AR-16, AK-47, G36, FN-FAL and Galil are not classified as assault weapons. If anyone wants the legal description of “Assault Rifle” as per the Bill Clinton assault weapons ban it is any semi-automatic rifle that includes 3 or more of the following features: Pistol Grip, Detachable Magazine, Folding stock, Flash Suppressor or Bayonet Lug. So the Sandy Hook AR would not have been classified as an Assault Weapon under the Clinton Ban as it only had the pistol grip and the detachable magazine that is if the picture that I saw on the news is in fact the weapon. The term “Assault Rifle” was used by the gun manufactures and sporting magazines such as Guns and Ammo and Field and Stream to sell these rifles and it worked. Another term used in those magazines was Parabellum. These are the same folks blaming the left and the media when it is misused when they only have themselves to blame for it. you are an idiot. M-16 and AR-15 are identical except for the sear block… the one part that makes it a full auto. plus the selector switch that prevents full auto. otherwise the same. i own one… a full blown democrat.. idiot repuke-lican. You are wrong. The m16 lower is machined differently to create a pocket for for the secondary sear and the hammer is modified to operate with this sear. The bolt is milled differently to trip the secondary sear after the bolt returns to battery and locks. A semi auto bolt will not trip the secondary sear. The m16 M4 is a short barreled rifle. A short barreled rifle can’t be purchased at a regular gun shop and requires, fingerprints, a tax and application to ATF (takes months). “Now try to explain this to a Dummiecrat I mean Democrat Liberal and they get all P.O.’d at you!” Sooooooooooooooooooooooo true. So was the AR-15 originally select fire? Or did it become select fire after it was made into the M-16? Also, when did civilian sales start? The reason why I’m asking is because I was certain I read somewhere that the AR-15 was marketed FIRST to civilians, then the military picked it up and had it made into a select fire M-16. I f this is correct, then it blows that Sandy-Hook lawsuit out of the water. That was at the top of the article. Yes the AR was a semi-auto. IMHO the Sandy Hook lawsuit has zero merit based on previous case law. But then I’m not a lawyer and most certainly not a demented Leftwing nut job afraid of their own shadows. I’m just afraid of a government that doesn’t respect my God Given Rights. I have a bit of an issue with the authors “16,973,489,012 companies are making AR-style rifles”. I’m going to guess that may high even for the nunber of MSR/AR/M4…rifles actually built. He said companies in jest not rifles. Read the article again!!!! He was joking about all the companies out there make AR style rifles, not how many rifles were produced. You need to read again what you quoted!!!! GD gave you the right to own a firearm? You are one dumb fucker. The right to defend ourselves is a natural/instinctual right not given by Government and not revocable by government. That is why we have the second amendment, it was SUPPOSED to prevent infringements by the government. People ignore the fact that SCOTUS is part of the government. Regarding the Sandy Hook lawsuit, it doesn’t matter that the AR15 was originally designed as a select-fire rifle. The crux of their argument is that the AR-15 we’re currently familiar with has no “legitimate” use aside from killing people. Considering that it’s one of the most popular rifles ever designed for plinking, target shooting, hunting and competition, that should be a hard argument to win. Colt was advertising the AR-15 SP1 from day 1 in 1964 as a hunting rifle. Its light weight, quick follow-up shot and synthetic materials (stable through moisture and temperature changes) made it an excellent choice for the sportsman in the field. While the AR15 was designed in select fire for martial purposes. it was designed in semi-auto for sporting uses. Two separate designs, two separate purposes. My reply to the question of semi-auto didn’t post, so I’ll try again. The original “AR15”–the Colt Armalite AR15 Model 01–was a select-fire rifle. While it was perfectly legal for civilian ownership under the NFA of ’34, the primary intended markets were military and law enforcement. After the military started placing orders and after they assigned the AR15 a military nomenclature (M16), Colt modified the design and reintroduced the AR-15 (note the hyphen) as a semi-auto only rifle, with a primary intended market of sportsmen. That rifle, released to the public in 1964, was the AR-15 Model SP1. Since 1964, most people have used the select-fire capability as the difference between the M16 and the AR-15. Finally! The answer that I came here about 2 hours ago to find. Another answer (below) helped because my AF experience fell our of memory some years back. I served active duty ’60 to ’68. Mimnimum weapons training. It was originally designed as a select fire rifle, The Air Force in 1961/62 originally ordered select fire (full auto) AR-15’s. The left side of the lower receiver was stamped ArmaLite AR-15 made by colt. At my first base in 1983 in the Air Force, the Security Police had one of those rifles Serial number below 2000. Colt started selling AR-15’s semiautomatic and full auto to the public in 1963ish. In 1963 to buy a full automatic weapon, all it took was a $200 tax stamp and the paper work at the ATF. We ever were put here. Black, white or any other color of skin or nationality should not make a difference, you break the law you pay, wether it be in prison or capital punishment, you did you pay! Thomas- well said– there is too much looking at the car and not the driver– All I hear is how we need our guns to defend ourselves from the criminal – but I believe we need our guns to protect us from our own government- they are the dangerous one– Yes we need some way to filter out the nut cases– but are we ready to conduct testing everyone.